Currently there are more than Million people worldwide playing Windows Games, Computer Games and Online Video Games, at least an hour a day, but the gaming servers are often insecure and misconfigured. 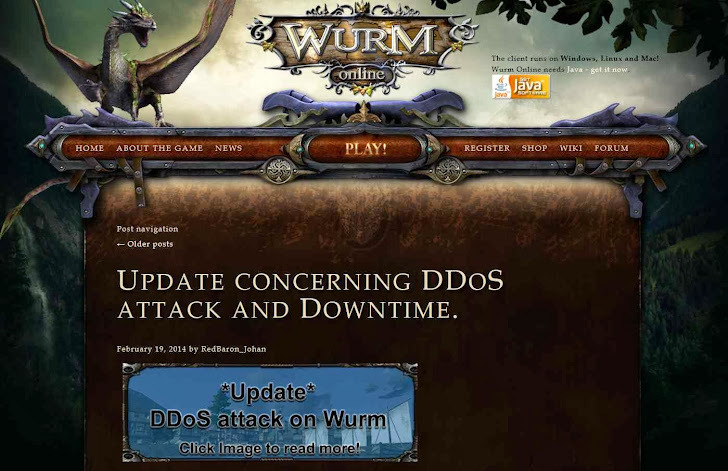 Yesterday, a popular multiplayer Free Online Game 'Wurm' servers were knocked offline by Distributed Denial of Service (DDoS) attack. Servers were targeted shortly after its most recent update. The Online Game company announced a Bounty Reward of €10,000 ($13,000) for information about the attacker involved in the recent DDOS attack. As the gaming servers go down, the company will lose gamers, reputation and revenue. The Wurn Online Game developer said: "We can offer 10,000 Euro for any tips or evidence leading to a conviction of the person responsible for this attack." Free Online Game service was already planning to change the server, but the DDoS attack made the gaming application offline for more than a day. "Shortly after todays update we were the target of a DDOS attack and our hosting provider had to pull us off the grid for now. We will be back as soon as possible, but things are out of our hands since their other customers are affected. As we wrote in a previous news post we are planning on changing hosting anyway, which should improve things for the future." Game Developer Rolf Jansson said. One of the Game Player posted "A DDOS attack is considered a "dumb" attack. [...] They simply control botnets (groups of innocent, unprotected computer users) to show their supposed strength. The truth? They are weak. They are, at best, script kiddies, no matter their true age." The Online Game is expected to come back online today. In Wurm Online, Players explore the game's world, modify terrain and create their own items and structures. Attacking an Online game website by DDoS attack proves the negative spirit of competition in the Gaming Industry.